Dutch firm DUS Public Architecture has switched gears from soap and water to polypropylene as they join the race (alongside British collective SoftKill Design and fellow Dutchman Janjaap Ruijssenaars) to complete the first 3D printed house. 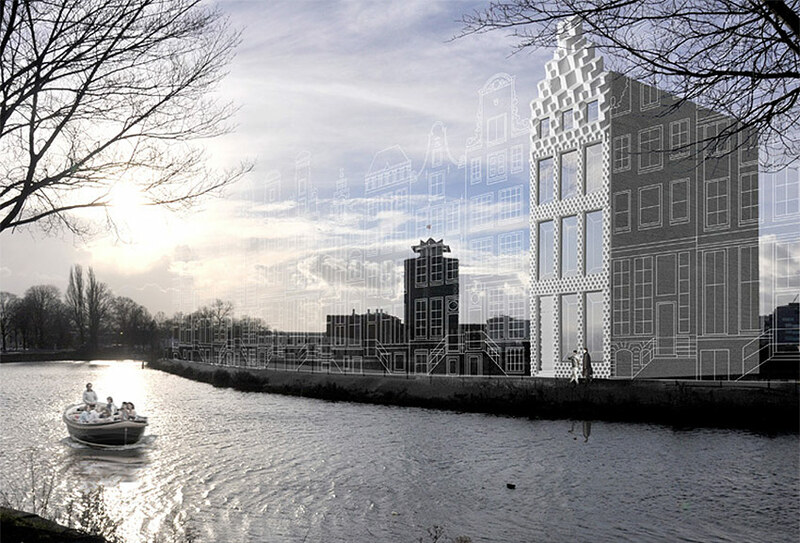 Their sights are set on a full-sized four-story canal house in Amsterdam, entirely printed and built on site by the KamerMaker, their own purpose-built 3D printer housed inside a verticle shipping container. Starting work in the next six months, DUS plan to have the entire facade and first room of the house printed and erected. With the “welcoming room” established, the architects hope to complete the rest of the house in the following three years. Each room of the house is to be devoted to a different facet of research, from turning potato starch into building materials, to recycling plastic bottles and crafting policy. While DUS plans to stay on the site for the next three years, they are ready to move at a moments notice: “We also had the idea that if at one moment we had to relocate it, we would just shred all the pieces and build it anew somewhere,” Heinsman told Dezeen.